I'm trying to create a window in a new scene but it is throwing an error when calling HorzCommand (Window_Command)'s initialize. I'm new to scripting in RPGMMV, sorry if it's a dumb problem. It would be much more convenient to see the full error log, because from what you sent I can't see the exception that got fired. edit: Nevermind, the title says it. Nevertheless, the error looks weird, have you done something to the horzcommand window itself or command window? As the title says, the error is that this.clearCommandList isn't a function. I didn't change anything in HorzCommand nor Window_Command. Is there a specofic reason behind the fact that there's that invalid state error? What if you launch it in the default exe? I'm running it with Firefox. About the invalid state error, I don't know too. Even with every plugin disabled it is still there. And I get the same error running from inside the engine, I prefer running in the browser 'cause of documentation access. Personal workflow I'd say. The state error is thrown when the game starts so I guessed it was "normal" or at least nothing that I need to worry about. What if you launch it from the normal exe (or normally through rpg maker)? Does it work? Nope, exactly same error, including the invalid state error. Looks like something is interfering with the way default horzcommand works. 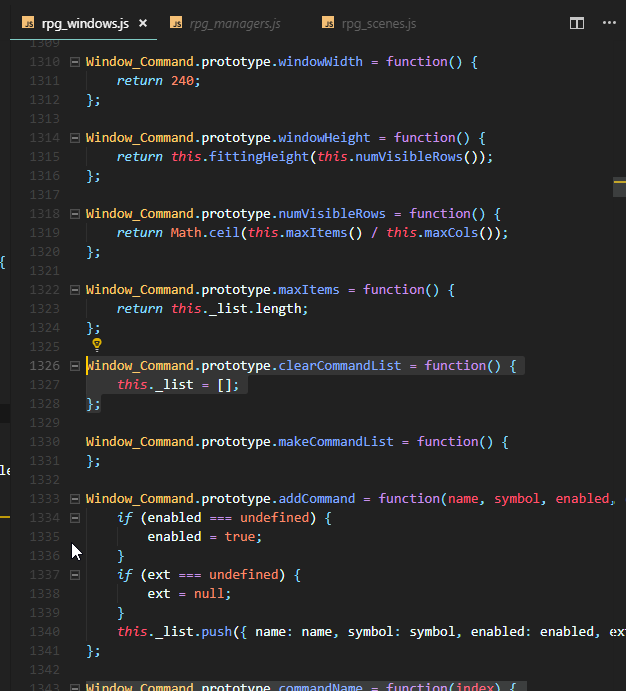 What if you just define the function manually imside your window via copy pasting? 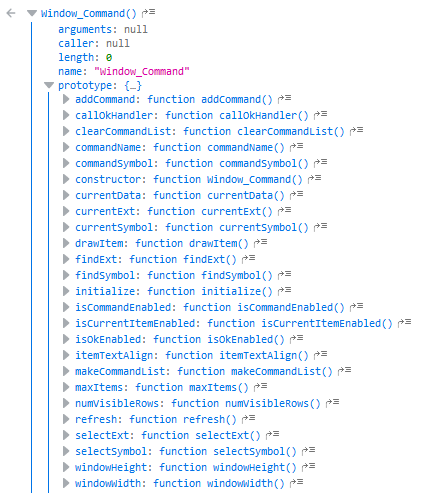 Tried defining the clearCommandList function both for the Window_Command and for my window's class and through the console, neither worked. Can you test my code there to see if it's something with the base RMMV's files? To be honest it was a really dumb problem, I was just tilted. You can't use arrow functions for those object functions because arrow function doesn't have it's own this.